You're at the right place. Welcome to our new website. Reserve your summer holiday now! Summer offer: free soft drink beverage package, barbecue terrace, thermal pool with outdoor pools, slides, canoe tour with tour guide. Relax in the gate of Őrség! Don't leave your dog at home! 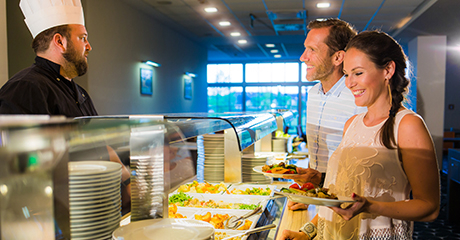 Fill yourself up with tempting dishes, 1500 nm watersurface, childanimation and different kind of programoffers in Őrség, Austria and Slovenia! The price includes free soft drinks. We welcome you at the meeting point of the Hungarian-Austrian-Slovenian borders, to the website of the 148-room Gotthard Therme Hotel & Conference****, which is situated in Szentgotthárd, in the most western Hungarian town. We await the guests, who like thermal spas, good cuisine and excursions to Austria and the Region Őrség, with comfortable rooms, high quality gastronomy in the gate of the Őrség. From the hotel, the Mediterranean-style St.Gotthard Spa & Wellness is accessible by a direct connection. It provides a relaxing stay with 1500 square meters water surface, special slides, Jacuzzis, saunas, sports facilities and wellness treatments. Surprise your loved ones with an unforgettable experience. Would you like to surprise your family and friends with a unique gift? Buy an Accent Hotels voucher today.